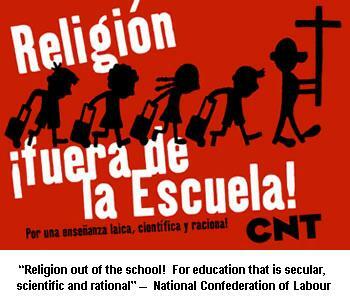 The ruling says the State cannot delegate education to the Church. The church-state agreements signed in 1979 [four concordats] could be formally invalid, on the grounds of incompatibility with certain constitutional rights simply on formal grounds. This is the opinion of the head of the Social Court 34 in Madrid, Antonio Seoane, who has raised this question of unconstitutionality before the Constitutional Court. The judge considered that much of the Concordat, especially in regard to religion classes and its consequences for teachers' rights does not conform to the Constitution. In a ruling that has been made public, but not yet decided by the High Court, the judge ruled in favour of the request of some teachers of religion who felt that it was a violation of their labour rights not to be treated equally with other teachers with regard to "the payment of three years" and the recognition of their seniority. The judge also does not agree with Article 7 of the Concordat, which establishes that the economic situation of teachers of religion will be agreed between the central government and the Conference of Bishops. This paragraph has denied job security for 30 years to the teachers who taught this subject, and allowed them to be "fired" (formally, "not renewed") by the Bishop without giving any reason. While not dealing with the [general] relation of religion to the Constitution, according to the ruling "the whole system being implemented has no basis, including the presence in state schools of teachers of religion." Thus, the religion classes in state schools may not be legitimate. According to the author of the ruling, the Concordat's concession to the Catholic Church allows it to administer the curriculum under conditions comparable to the other subjects which "are transfers of real competency in the area reserved by the Constitution for the government".